Nestled in the grass under the big palm tree by the edge of the desert there is an entire civilization--a civilization of beetles. In this bug's paradise, beetles write books, run restaurants, and even do scientific research. But not too much scientific research is allowed by the powerful elders, who guard a terrible secret about the world outside the shadow of the palm tree. Lucy is not one to quietly cooperate, however. This tiny field scientist defies the law of her safe but authoritarian home and leads a team of researchers out into the desert. Their mission is to discover something about the greater world...but what lies in wait for them is going to change everything Lucy thought she knew. 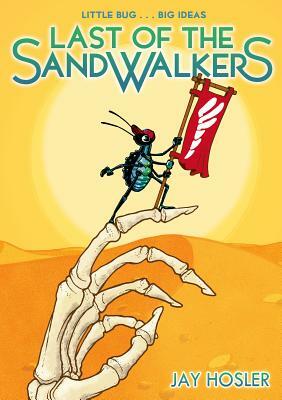 Deftly combining suspenseful adventure storytelling with the principles and tools of scientific inquiry, entomologist and cartoonist Jay Hosler has created in Last of the Sandwalkers a tale that satisfies and fascinates even the most bug-averse among us. Jay Hosler is a biology professor at Juniata College, and a cartoonist. He enjoys telling stories about science and the natural world, and his first graphic novel (Clan Apis) won a Xeric Award and was selected for YALSA's "2002 Popular Paperbacks for Young Adults." His book Evolution: The Story of Life on Earth, was a 2011 Junior Library Guild selection, a nominee for YALSA's 2012 "Great Graphic Novels for Teens," and has been included in the Texas Library Association's "Maverick Graphic Novel Reading List." He lives in central Pennsylvania with his wife and his two little nerdlings.